The flat coastline north and south of Monimaskit, the rich, rolling farmland surrounding it, and the douce, settled sandstone streets of the town itself, give, to the innocent stranger, little indication of the rugged, wild and inhospitable interior to be found only a score of miles distant, where the lower slopes of the Grampian range commence. On these slopes, tradition has it, the lost battlefield of Mons Graupius lies, where, some maintain – and this in defiance of Tacitus, who was but a Roman after all – the legions were put to flight when the Caledonian tribes gathered together, and, setting aside their differences, dared, under the leadership of the warrior chieftain Calgacus, to resist subjugation. The Keldo Water flows from these hills to Monimaskit, and, where it passes through the town and enters the sea, it presents a steady and stately face to the world; yet, between its source and its mouth this river takes at times a tumultuous course, and at no point is this more the case than a mere four or five miles upstream from Monimaskit, and but two from Keldo House. Here it rushes and roars through a gulf of great depth known in the locality as the Black Jaws. This ravine, split originally perhaps by ice and subsequently scoured by the torrents of millennia, consists of walls two hundred feet in height which are always soaked black with the spray of the foaming water, and which are home to a dense mass of vegetation – mosses, ferns and grass, and trees clinging with the most tenuous grip to clefts and cracks in the rock. 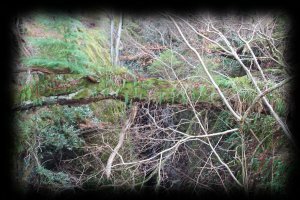 Above this gloomy drop the land is so thickly wooded with birch and pine that, were it not for the constant booming of the water, the unwary visitor would be almost over the precipice before he realised its existence. It was once the supposed sport of town lads to traverse the gorge on the trunks of trees which, uprooted in winter storms, had fallen across it, but in truth these narrow and slippery bridges are so dangerous that few must have dared such an adventure, and certainly I have never heard of any boy in the present time who had courage enough to essay that dread crossing. Even from the path which wends its way along one of its sides it is quite unnerving to peer down into the chasm, where the warmth and light of the sun never penetrate, and to see forest birds flitting in and out of the foliage and through the spray like seagulls on a dizzy, over-beetling ocean cliff; and it is easy to imagine that the echoing din is a chorus of lost souls cast into the awful void, or the triumphant roars of the demons that persecute them.